Rescatux 0.40 beta 11 has been released. Rescatux 0.40b11 size is about 671 Megabytes. This release comes with one of the most exciting improvements in many years: Most of the options show its subtasks progress while working. That means that the final user will not doubt about Rescatux being frozen or not while he sees an apparently frozen screen. I have been working on making all the source code available but as I have mentioned on the Debian Live mailing list it is not easy. Another big improvement towards usability is renaming the older ‘Not detected’ partitions to: ‘Windows / Data / Other’ so that people don’t get confused. Many people think their windows is not being detected while there is a windows there. I guess the partition selection entries could be improved in the future so that they show the actual Windows name (Thanks to os-prober algorithms) and also the filesystem type. Many other smalls bug fixes have been done. You can check the git log for more details. I have decided not to release stable release till I add one or two UEFI related options. The one about ordering UEFI boot entries would be there for sure. The current roadmap had been planned for 2012 so it needs some update. 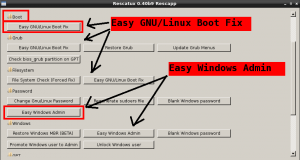 It’s true that current Rescatux supports booting from an UEFI system and that if you had already installed grub-efi it reinstalls it in its UEFI partition. But it’s also true that one or two more UEFI options are needed so that magazines stop advising to use Boot Repair inside Rescatux. UEFI feedback is still welcome. Specially if the Debian installation disks work for you but not the Rescatux ones. Rescatux 0.40 beta 9 has been released. Rescatux 0.40b9 size is about 671 Megabytes. Putting aside the need for making sure USB automount is disabled and other burocratic tasks I think this release would be pretty similar to the next stable release. 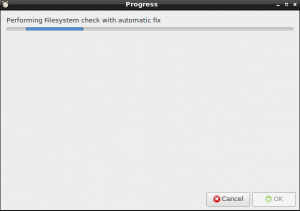 Easy GNU/Linux Boot Fix : This option combines three previous options of Rescapp into one: Force a filesystem check, update grub menus and finally restore grub into the mbr (or efi). At the same time it guides non technical savvy people to use this option because it’s under Boot (which it’s a new group of options). Easy Windows Admin : This option provides you the ability to take back control of a Windows installation by the means of: Unlocking, promoting to Admin and blanking the password of a given Windows account. Many code in the grub side and in the windows registry side has been rewritten so that these new features could be rewritten. As a consequence it will be easier to maintain Rescapp. Finally the chntpw based options which modify the Windows registry now perform a backup of the Windows registry files in the unlikely case you want to undo some of the changes that Rescapp performs. I guess that in the future there will be a feature to be able to restore such backups from Rescapp itself, but, let’s focus on releasing an stable release. It’s been a while since the last one. Packages versions for this release can be found at Rescatux 0.40b9 packages. Rescatux 0.40 beta 8 has been released. Rescatux 0.40b8 size is about 671 Megabytes. This release readds support for changing keyboard layout when starting Rescatux. I want to thank Intrigeri from Tails project for his support. I will try to convert tails-greeter into a project suitable por other Debian Live based distros but it’s not an easy task. Packages versions for this release can be found at Rescatux 0.40b8 packages. 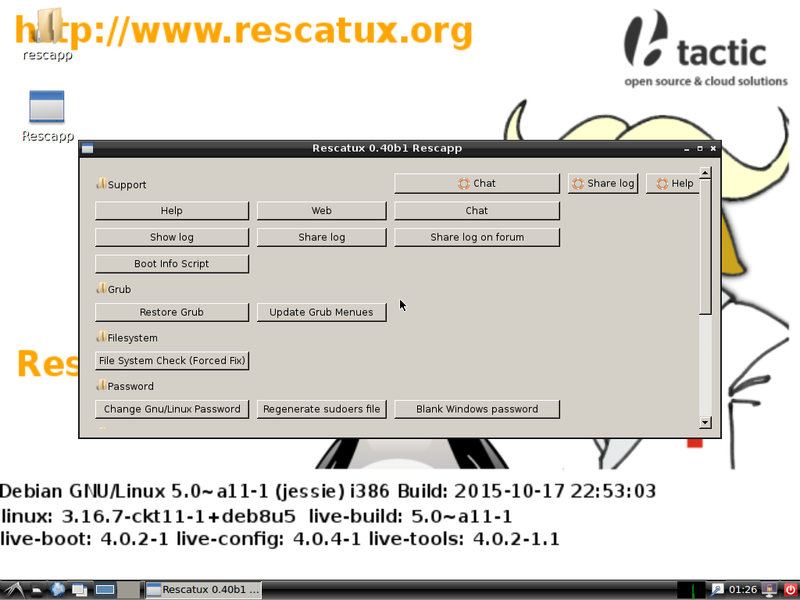 Rescatux 0.40 beta 7 has been released. Rescatux 0.40b7 size is about 608 Megabytes. This release has minor fixes on UEFI boot. 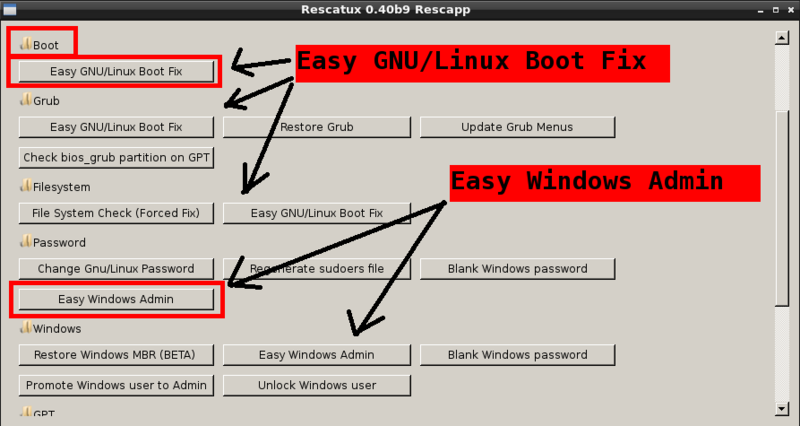 Some people had problems with Rescatux 0.40b6 not booting in UEFI mode (non secure boot UEFI mode). I suspect those people could be able to boot from Rescatux 0.40b5. So, now, they should be able to boot from Rescatux 0.40b7. As I already mentioned in Rescatux 0.40b6 it does not support Secure boot yet. The reason is we are going to rely on the debian-cd team work inside Debian itself and they have not finished with it yet. 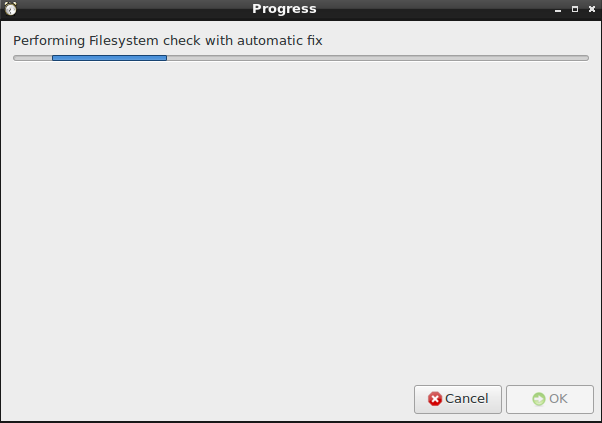 I am trying to polish this work so that it finally makes into Debian. It’s not obvious as it would seem originally with the current live-build framework based on bash. ( live-build UEFI boot support bug ). If you have a UEFI boot-only system feedback is welcome. Specially if the Debian installation disks work for you but not the Rescatux ones. Finally I want to make clear that we don’t support fixing specific UEFI issues yet from inside Rescapp native options. If you run the Restore Grub option and your Grub was originally setup in an EFI way it should probably fix it though. You can also use boot-repair for UEFI issues, of course, which it’s included inside Rescatux, but that’s not supported by us. Packages versions for this release can be found at Rescatux 0.40b7 packages. 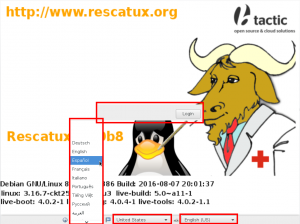 Rescatux 0.40 beta 6 has been released. Rescatux 0.40b6 size is about 603 Megabytes. This release improves support for both 64-bit amd64 UEFI boot (avoids booting in blind mode problems) and 32-bit UEFI boot (not tested that one myself). It should be bootable from some Intel-based Mac Book (Pro) systems too. We also add AFD scanning technology to reduce user interface time based interactions while scanning the computer system. Finally some of the internal code has been updated to reflect the new repositories which are found in github rescatux’s organization. 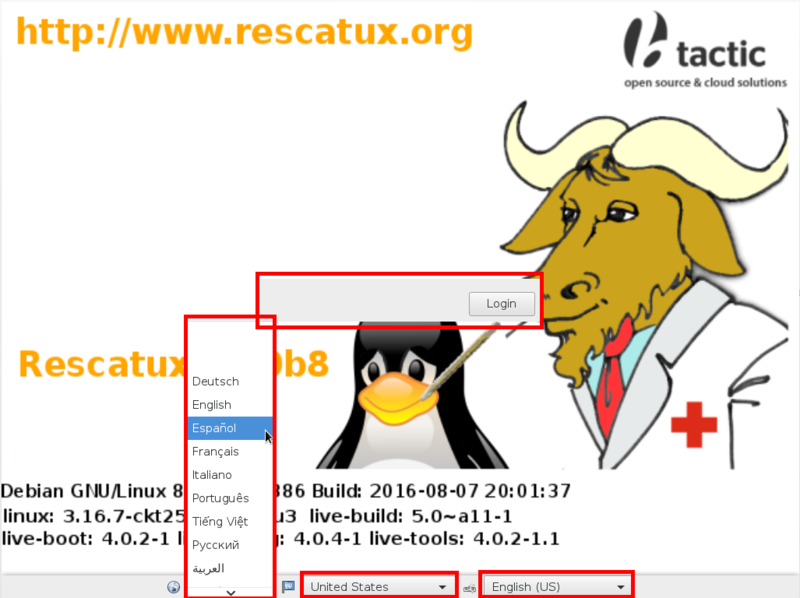 So if you already have Rescatux 0.40b5 you do not need at all to download Rescatux 0.40b6 unless you are concerned about UEFI boot. Anyways it’s always nice for you to have the latest version so that you can give us feedback. It does not support Secure boot yet. The reason is we are going to rely on the debian-cd team work inside Debian itself and they have not finished with it yet. Finally I want to make clear that we don’t support fixing specific UEFI issues yet from inside Rescapp native options. If you run the Restore Grub option and your Grub was originally setup in an EFI way it should probably fix it. 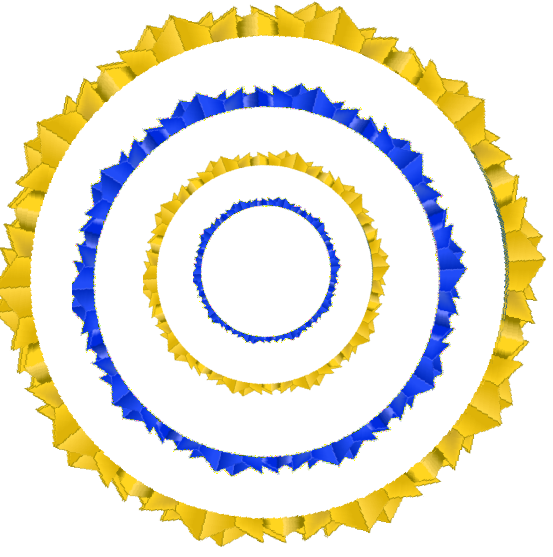 Packages versions for this release can be found at Rescatux 0.40b6 packages. Rescatux 0.40 beta 5 has been released. Rescatux 0.40b5 size is about 603 Megabytes. This release adds support for both 64-bit amd64 UEFI boot (most common) and 32-bit UEFI boot (not tested that one myself). It should be bootable from some Intel-based Mac Book (Pro) systems too. I am pushing this work into Debian so that live-build has UEFI boot support by default. This was possible thanks to the great feedback from prolinux.de (it’s the only community where I gather quite useful feedback on their comments) which had made me think about reconsidering UEFI boot support and, even if possible, Secure boot support.